REDSEA Gallery is pleased to present Emociones, a solo exhibition of bronze sculpture by Spanish artist Jesús Curiá, on view from 18 November through 10 December 2017 at 9 Dempsey Road. Comprised of 22 sculptures spanning a period of 4 years (2013-2017), the exhibition demonstrates the breadth of Curiá's body of work. Jesus Curiá's practice is concerned with capturing the essence of the human being. 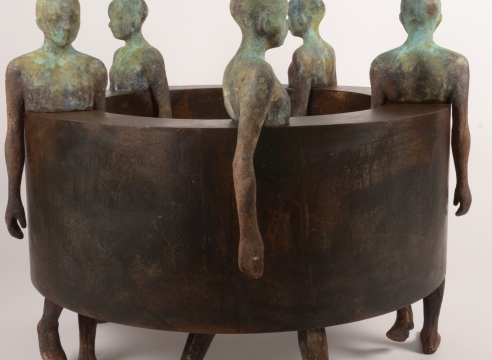 His sculptures blend figurative elements – often heads and hands – with abstracted bodies in an attempt to express tradition, modernity and ethnic culture, which have remained the foundation of his approach throughout the years. Curiá's characters, which have an almost ancient quality, are a reflection of the artist's ideas and emotions toward the contemporary world – raising questions of identity, community and globalisation. Ambiguity in the expression of Curiá's figures is fundamental to the artist's visual language. The facial features in his works are neither western nor non-western, male nor female. Curia's sculptures are archetypes, eliminating boundaries and the qualities that distinguish and divide us. As a result, they are a tribute to the human being itself, and the principles that unite us. Their powerful forms and gestures evoke a broad range of emotions including joy, serenity and, at times, loneliness. Curiá's choice of materials is of equal importance in understanding his work. Though primarily working in bronze, the artist's thoughtful integration of wood, stone, concrete and resin is directly related to the idea he wishes to express through each sculpture. Echoing the complexity of man, Curia's blending of soft and hard, warm and cold materials signifies the opposing characteristics found in all of us. Several of Curiá's recent works address issues related to our growing reliance on technology. The hybrid figures in his 'Deseo' series imagine the merging of man and machine, combining anatomical forms with automobiles, motorcycles and jet planes. Other sculptures in the exhibition speak of love & resilience in the modern age. The overall message in Curia’s work is one of optimism – envisioning mankind’s march into a future of peace and harmony.